Tree Pruning, Removal, and More in Walnut Creek, CA. We serve the following areas: Alamo, Danville, Blackhawk, Lafayette, Orinda, Walnut Creek, Moraga, and Pleasant Hill. 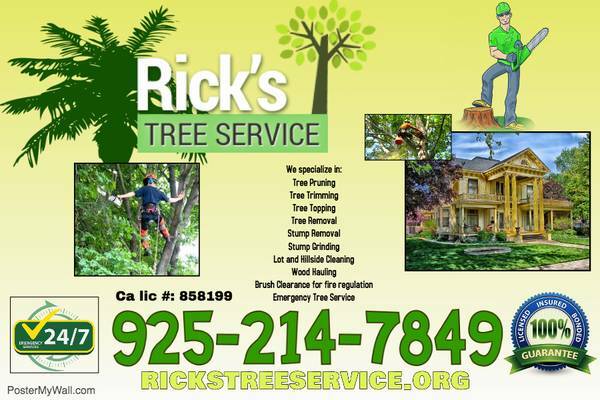 At Rick's Tree Service, we have more than 20 years of experience in residential and commercial tree pruning and removal throughout the East Bay Area. Rick's Tree Service serves as a leading contractor in the Walnut Creek area. We're a team of fully-certified professionals who tackle everything from complex large projects to smaller scale jobs. Fueled by our commitment to excellence, we go the extra mile to make sure clients are completely satisfied with our work. Call us today to schedule a consultation.